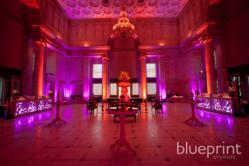 Maharaja, One-of-a-kind Opening Celebration was exquisitely designed by Blueprint Studios. A grand fundraising event celebrating the opening of Maharaja- The Splendor of India’s Royal Courts was held at the Asian Museum in San Francisco this past Wednesday. An unprecedented 650 donors attended the event, exquisitely designed by Blueprint Studios, the San Francisco event design company announces. As the honored guests entered the museum, they were escorted past grand staircases, lined with traditional Indian lanterns and colorful flowers to the Samsung Hall for an exclusive cocktail reception. Here, a brilliant color pallet of magenta and gold, used in specialty fabrics, furnishings and illuminated bar stations, greeted them. 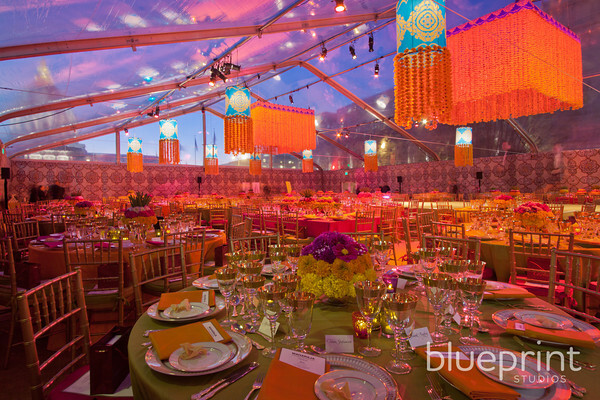 After some quiet mingling and expressions of gratitude, the guests were escorted to a one-of-a-kind dinner reception held in an 8000 square foot clear top tent, with a canopy of 3000 illuminated marigold strands elevated above. “A truly breathtaking setting”, states one of the donors. “Traditional Indian food prepared by a renowned local Indian Chef, was served on exquisitely set dining tables with alternating palettes of fusia, saffron and gold”, she continues. The alternating table color schemes seemed to create visual movement, which made this dining experience into something truly extraordinary”. The entire perimeter of the Asian Museum’s dining hall was wrapped in custom fabrics, with highlighted detail resembling the ones found in India’s Royal Palaces. Delightful entertainment was provided by traditional Indian dancers on an elevated center stage below a canopy of elevated marigolds. 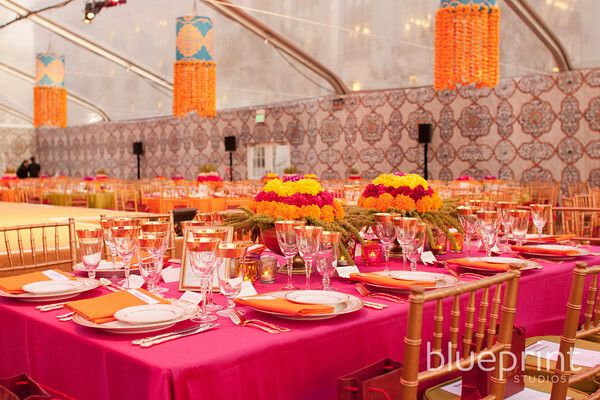 “The Maharaja opening celebration event raised several million dollars for the Asian Art Museum. We are very proud to be a part of helping the Asian Community keeps its heritage alive and thriving,” states Paul Moss, partner/cofounder of Blueprint Studios. For more information on Blueprint Studios, call 415-813-4208 or visit http://www.blueprintstudios.com. Blueprint Studios is located at 1555 Bancroft Ave., San Francisco, CA 94124. The San Francisco event planning company, Blueprint Studios is dedicated to creating exceptional special event environments with thoughtful detail and dedicated customer service to allow for easy event planning. For over a decade, Blueprint Studio’s team of designers, production craftsmen and installation managers has established a reputation for providing cutting edge event design and decor, floral design and stylish furnishings for both timeless and modern settings.